Recent Rochester Institute of Technology (RIT) grad, Maria Victoria Savka, is new to the festival and bringing her herd of prints with her! Marie thinks Canandaigua is a lively town with a strong arts community, and enjoys visiting Main Street and area galleries. Maria took part in RIT’s Fine Arts Studio and Illustration BFA programs and is an active member of the Print Club of Rochester. Most of her recent work has been influenced by things that surround me, such as animals or landscapes. She is interested in conveying a whimsical and abstracted approach to her work. Maria uses many mediums for her work, as she likes to test herself and practice various methods. At the moment, she’s an avid printmaker, creating drypoints based on the quirks and personalities of animals. The time it takes to create a drypoint animal prints varies based on the image. First she likes to get a feel for her reference by drawing it in various ways prior to scratching into my printmaking plate. Drypoint printmaking is a subtractive process, where a sharp, needle-like tool scratches into a plate to form an image. It can be seen as a form of etching where no chemical is used, thus it has been named ‘dry–point’. Traditionally printmakers use copper plates, but currently many use laminated cardboard, zinc, and plexi-glas to create their images. Maria uses an exact-o knife for my prints, crosshatching the patterns and images into the plates. Through her various crosshatching drawing she selects which she believe is the strongest and begins to lay out the pattern on her plate. Scratching it into the plate she creates her image’s opposite. Maria complete my plate once the image is scratched into the plate. The time it takes to creating each print varies on whether she needs to prepare chine colle to the paper (gluing collage papers to the paper prior to printing over it), apply ink for the background or just create a proof. It’s an experimental process as you can never guess how the water, pressure of the press and ink will react and sometimes you get the most unexpected surprises! The one thing Maria has learned from her work is that her artwork is very flexible and tends to have many happy accidents! She enjoys experimenting with new techniques and seeing how it can change the image. Jackie Powley creates one-of-a-kind portraits of any loved animal. She uses mixed media to draw each portrait, combining marker, charcoal, color pencils, pen and ink. Personalized Pet Portraits are close-up head shots of animals. Jackie believes “eyes are the windows to our soul” and one can tell a lot about an animal’s personality by their eyes. If you are interested in a personalized portrait of your pet, you may email jackiepowley@gmail.com with a picture, past or present, and she will take care of the rest. 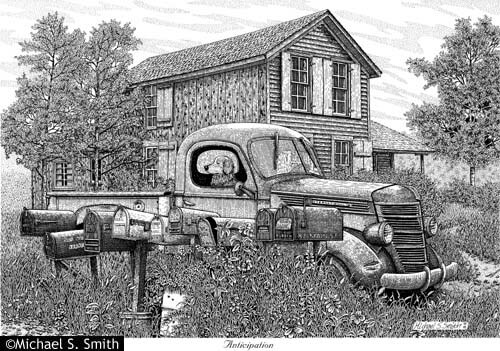 Michael Smith is a Pen and Ink Illustrator who is known for his extremely detailed images of nature, local and regional buildings, and landmarks. 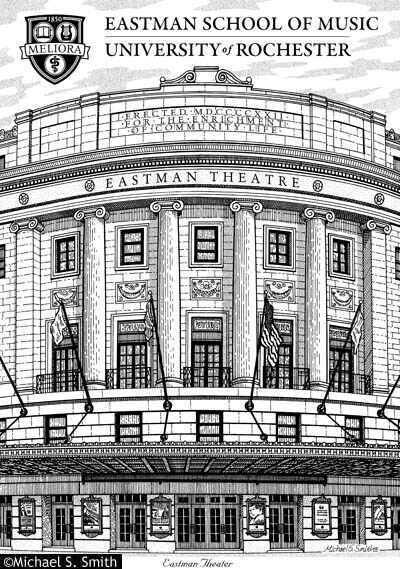 Among his drawings are local scenes, high schools, colleges and universities, historical landmarks, nostalgic material, and much more. 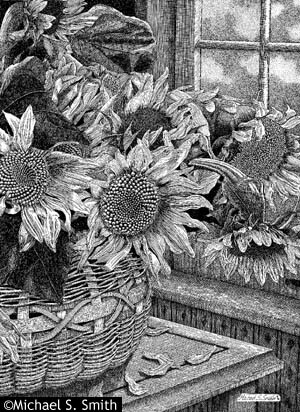 Always passionate about drawing since he was a young child, and always interested in highly-detailed work growing up, Michael continued practicing Pen and Ink throughout college. In college, Michael studied and graduated with experience in fine arts, illustration, and graphic design. This allows him to incorporate text into his artwork, such as logos, names of buildings, and landmarks. You can view Michaels work on his Web site, http://www.mssgraphics.com, or by visiting his booth at this year’s Canandaigua Art and Music Festival, Friday, June 16th through Sunday, June 18th.